Social media has become an integral part of our daily lives. Right from blogging about your experiences, posting videos, starting discussions on your favourite topics and sharing viral content, everything is possible with social media. Learning as an experience as well as an industry is not unaffected by this trend. In fact as more learning goes online, it is something that will need to be embraced as a toolset to improve user engagement and reach by Learning management systems. Shika has embraced this very early in its product lifecycle and is always evolving its feature set to make it a true Social Learning Management System. 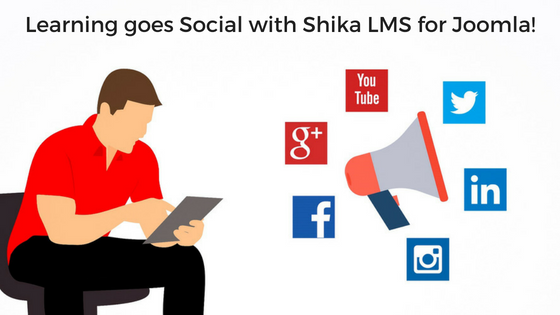 Read on to see what features Shika offers that gives it a Social edge! Integrating Facebook, Google+, Twitter-like and share buttons on your course pages is easy as pie in Shika. Users/students can easily share their favourite course pages on social media. Thus, more users gain exposure to the course via social media. The number of shares on social media will further highlight the popularity of the course. Comments allow users to express their opinions about various aspects of the course. It could be feedback to the course author or general reviews by users/students to share their experiences on the course. Commenting is threaded as well as open to the public. Course likes and comments are offered via jLike. It can also be used as a course specific Q&A area by the student and the teachers. Course recommendations can be given by any of the users registered on the system to their friends or any user on the Joomla website. Depending on whether you are using plain Joomla or a Social networking extension, this allows recommending courses to anyone of the website or just your Friends. Recommended courses are a great way to drive learning in a Social manner. This feature is available if you have integrated Shika with JomSocial or EasySocial. Groups are the place where all the course related discussions and interactions take place amongst the students and their teachers. Groups provide features like discussions, media sharing and a lot more to bring a fantastic co-learning experience. Shika seamlessly integrates with popular Social networking systems like JomSocial and EasySocial. Shika connects to the Avatars and links to profiles of the respective Social network that the Social integration is activated within the backend configuration. By displaying avatars of users or friends of the student across the front end interface, a feeling of familiarity and friendliness and the curiosity to explore more content by the end user is possible. Though Shika has its own activity stream, however, if you are integrating a Social network of your own, then we support pushing activities into the supported Social Stream of the user. This adds massive value to learning in the network by promoting content discovery and peer interaction on gaining knowledge and unlocking new achievements. Following screenshot highlights Shika’s integration with EasySocial activity stream. Rewards are an excellent way to promote e-learning. Points integration will let you do this quite easily. Shika supports integration with JomSocial as well as EasySocial points systems. With Shika 1.1.12, we have provided feature support for AltaUserPoints. Users will be allocated points based on each course enrollment and on completion of each lesson attempt. Doesn’t it feel great to show off an achievement and get recognition for it? It serves as a great learning accelerator for not only the person who achieved something but also to their peers. Shika integrates with EasySocial Badges and these can be awarded using the same criteria for certification. Suppose you select an EasySocial badge to be awarded against a course, then the badge is awarded automatically when the certification criteria are met. Like what you see? Get started with Shika now!